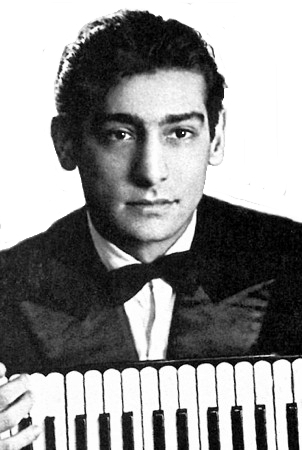 Information: Misho Gurov, accordionist and close friend and colleague of the musician Boris Karlov. 1935  Born in Zaječar, Serbia. 1995  Released a CD by Anthony Michaels Records, Los Angeles, California, of 7 tracks recorded in the 1950s and 1960s at Radio Sofia. "Anthony Michaels" may be Gjurov's son who was living in Southern California. Liner notes written by Tim Rice. Two cuts appeared on Dennis Boxell's 1960s LP Folklore Dances of Bulgaria, Slavjani 1000": "Pravo Trakiisko" and "Mûshko na Lesa" ("Godechko" on the CD). Other cuts: "Šumakisko II" (used by Yves Moreau for "Vidinsko Horo"), "Slivniško," and "Šumakijsko. 1964  Played at Karlov's funeral. 1969  Died of cancer.